Michael Faraday (1791-1867) is probably best known for his discovery of electromagnetic induction, his contributions to electrical engineering and electrochemistry or due to the fact that he was responsible for introducing the concept of field in physics to describe electromagnetic interaction. But perhaps it is not so well known that he also made fundamental contributions to the electromagnetic theory of light. In 1845, just 170 years ago, Faraday discovered that a magnetic field influenced polarized light – a phenomenon known as the magneto-optical effect or Faraday effect. To be precise, he found that the plane of vibration of a beam of linearly polarized light incident on a piece of glass rotated when a magnetic field was applied in the direction of propagation of the beam. This was one of the first indications that electromagnetism and light were related. The following year, in May 1846, Faraday published the article Thoughts on Ray Vibrations, a prophetic publication in which he speculated that light could be a vibration of the electric and magnetic lines of force. Faraday’s case is not common in the history of physics: although his training was very basic, the laws of electricity and magnetism are due much more to Faraday’s experimental discoveries than to any other scientist. He discovered electromagnetic induction, which led to the invention of the dynamo, the forerunner to the electric generator. He explained electrolysis in terms of electrical forces and also introduced concepts such as field and lines of force, which not only were fundamental to understanding electrical and magnetic interactions but also formed the basis of further advances in physics. Michael Faraday was born in South London to a humble family. The only basic formal education he received was in reading, writing and arithmetic as a child. He left school when he was thirteen and started working in a bookbinding shop. His passion for science was awakened by the description of electricity he read in a copy of the Encyclopædia Britannica he was binding, after which he started experimenting in an improvised laboratory. Faraday was hired in 1813 as Humphry Davy’s laboratory assistant at the Royal Institution in London, where he was elected a member in 1824 and where he worked until his death in 1867, first as Davy’s assistant, then as his collaborator, and finally, after Davy’s death, as his succesor. Faraday made such an impression on Davy that when the latter was asked about his greatest discovery, Davy answered: “My greatest discovery was Michael Faraday”. In 1833 he became the first Fullerian Professor of Chemistry at the Royal Institution. Faraday is also recognized as a great popularizer of science. 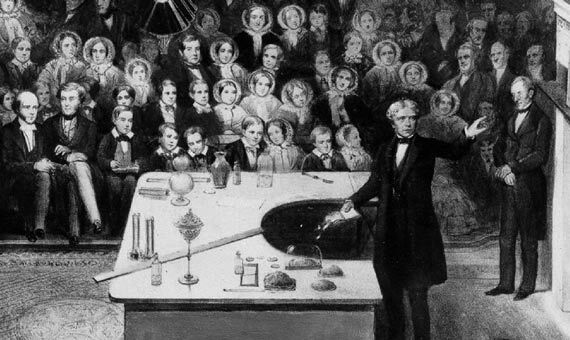 In 1826 Faraday established the Friday Evening Discourses at the Royal Institution, which are a channel of communication between scientists and laymen. The following year he launched the Christmas Lectures for young people -now broadcast on national television every year-, a series whose objective is to present science to the general public. Faraday himself gave many of these lectures. Both of them continue to this day. 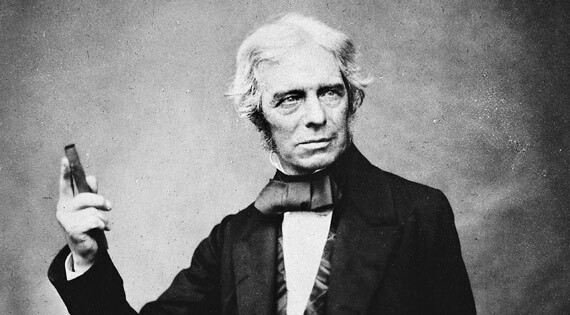 Faraday made his first discovery of electromagnetism in 1821. He repeated Oersted’s experiment placing a small magnet around a current-carrying wire and verified that the force exerted by the current on the magnet was circular. As he explained years later, the wire was surrounded by an infinite series of circular concentric lines of force, which he termed the magnetic field of the current. He took the work of Oersted and Ampère on the magnetic properties of electrical currents as a starting point and in 1831 achieved an electrical current from a changing magnetic field, a phenomenon known as electromagnetic induction. He found that when an electrical current was passed through a coil, another very short current was generated in a nearby coil. This discovery marked a decisive milestone in the progress not only of science but also of society, and is used today to generate electricity on a large scale in power stations. This phenomenon reveals something new about electric and magnetic fields. Unlike electrostatic fields generated by electric charges at rest whose circulation along a closed path is zero (a conservative field), the circulation of electric fields created by magnetic fields is along a closed path other than zero. This circulation, which corresponds to the induced electromotive force, is equal to the rate of change of the magnetic flux passing through a surface whose boundary is a wire loop (Faraday’s law of induction). Faraday invented the first electric motor, the first electrical transformer, the first electric generator and the first dynamo, so Faraday can be called, without any doubt, the father of electrical engineering. Faraday abandoned the fluid theory to explain electricity and magnetism and introduced the concepts of field and field lines, moving away from the mechanistic explanation of natural phenomena like Newton’s actions-at-a-distance. Faraday’s introduction of the concept of field into physics is perhaps his most important contribution and was described by Einstein as the great change in physics because it provided electricity, magnetism and optics with a common framework of physical theories. However, Faraday’s lines of force were not accepted until several years later when James Clerk Maxwell entered the picture. “Today worked with lines of magnetic force, passing them across different bodies (transparent in different directions) and at the same time passing a polarized ray of light through them (…) there was an effect produced on the polarized ray, and thus magnetic force and light were proved to have relation to each other”. “This fact will most likely prove exceedingly fertile and of great value in the investigation of both conditions of natural force”. He was not wrong. This effect is one of the cornerstones of the electromagnetic theory of light. “I think it likely that I have made many mistakes in the preceding pages, for even to myself, my ideas on this point appear only as the shadow of a speculation”. “The conception of the propagation of transverse magnetic disturbances to the exclusion of normal ones is distinctly set forth by Professor Faraday in his ‘Thoughts on Ray Vibrations’. The electromagnetic theory of light, as proposed by him [Faraday], is the same in substance as that which I have begun to develop in this paper, except that in 1846 there were no data to calculate the velocity of propagation”. 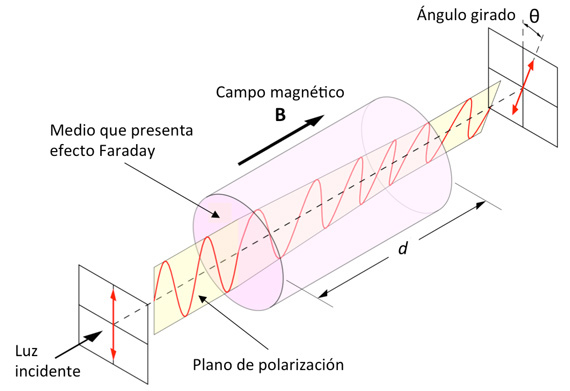 “Faraday discovered that when a plane polarized ray transverses a transparent diamagnetic medium in the direction of the lines of magnetic force produced by magnets or currents in the neighbourhood, the plane of polarization is caused to rotate”. In all Michael Faraday is cited six times and mentioned three times in Maxwell’s 1865 paper. However, this is not surprising considering that a large amount of Maxwell’s work is based on Faraday’s work and Maxwell mathematically modelled most of Faraday’s discoveries on electromagnetism into the theory that we know today. The electromagnetic waves about whose existence Faraday speculated in 1846 with his thoughts on ray vibrations, and which were mathematically predicted by Maxwell in 1865, were finally produced in a laboratory by Hertz in 1888. The rest is history. It is clear that Maxwell opened the door to twentieth century physics, but it is no less clear that Faraday gave Maxwell some of the keys he used. In 1676 Newton sent a letter to his rival Hooke in which he wrote: “If I have seen further, it is by standing on the shoulders of Giants” (*). Two hundred and fifty years later, during one of Einstein’s visits to Cambridge, UK, someone remarked: “You have done great things, but you stand on Newton’s shoulders”. Einstein replied: “No, I stand on Maxwell’s shoulders”. If someone had said the same to Maxwell, he would probably have said that he stood on Faraday’s shoulders. (*) Although this sentence is interpreted by some authors as a sarcastic remark directed at Hooke’s hunchback appearance, nowadays the phrase is usually used in a positive way. Now Newton’s comment is a claim how science is a series of incremental advances reach of which is built on those previously reached (see, for example, Stephen Hawking’s book titled On the Shoulders of Giants). Ordóñez, V. Navarro and J. M. Sánchez Ron, Historia de la ciencia (Espasa Calpe. Madrid, 2013). Forbes and B. Mahon, Faraday, Maxwell, and the Electromagnetic Field: How Two Men Revolutionized Physics (Prometheus Books. New York, 2014).